Original 1999 Le Mans Race Poster. June 12 & 13, 1999. The 1999 Le Mans poster is part of the "The mythic inspiration of the race" era in Le Mans posters which lasted from 1998 to 2000. Design of the 1998 Le Mans poster was in the hands of the Grand Public agency and was based on a color photograph. Myth meets humor could very well be the theme of this poster. The potential winners are highlighted in the spirit of an open race with no foregone conclusion. The cars are not on the track - a first in Le Mans history - but still in the pits under their covers. The spectators are directly targeted by this posters and feel that they are an integral part of the Le mans 24 Hours legend. 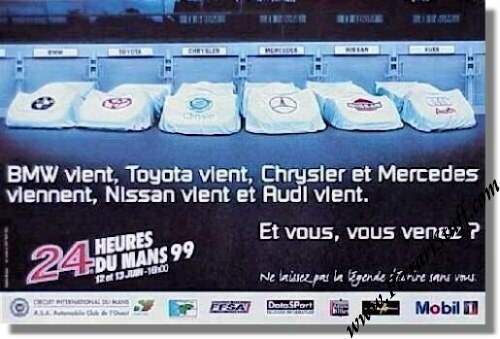 The main punch line is "BMW vient, Toyota vient, Chrysler et Mercedes viennent, Nissan vient et Audi vient. Et vous, vous venez?" which loosely translates into "BMW comes, Toyota comes, Chrysler and Mercedes come, Nissan comes and Audi comes. And you, are you coming as well?". It also again features the slogan "La legende s'ecrit devant vos yeux" which loosely translates into "The legends is written before your eyes". The race was won by Joachim Winkelhock, Pierluigi Martini and Yannick Dalmas in their # 15 BMW V12 LMR with a total of 365 laps to their name. For the full results of this race, please see 24 Heures du Mans results 1999.